Preheat oven to 200 °C (180 °CfFan forced). Mix mushrooms, tomatoes and herbs in an ovenproof dish. Whisk garlic, lemon juice, vinegar and oil. Pour over mushroom mixture. Loosely cover with foil and cook in oven for 20-25 minutes. Heat the bread during the last 5 minutes of cooking. Cut the loaf in half lengthways and cut each half into 4. 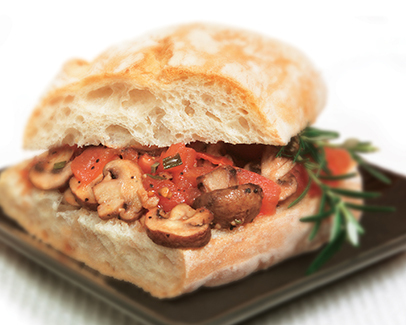 Spoon mushroom mixture onto bread, grill and garnish with rosemary. For a quicker alternative, gently simmer the mushroom mixture in a covered frypan for 10-15 minutes. Heat the loaf for 5 minutes in the oven to make it crisp.